Fuller Center for Housing board member Bob Abel lost both of his parents last year, 68 days apart. But Kathryn, 90, and Fred Abel, 93, lived long lives of Christian service and passed on their values to Bob. The family I worked with Domatilda Mancha Quispe and her three sons — Juan, Luis and Hector — were a joy to get to know and share the week with. Couple that with about 50 spirited volunteers who at their own expense and time ventured to La Florida to build in a Christ-centered environment, and the result is an amazing week. Working together, it is amazing how quickly smiles, hugs and gestures can replace communication when the language fails you. I could not have found a better way to honor Mom and Dad’s memory than by sponsoring the home for Domatilda and her family. Late in the week, we were ready to set a small interior wall when Domatilda grabbed a broom and, while we waited — holding the wall — she swept the area where the wall was to be placed. I knew my mother was with us in that very moment. Actually, I knew Mom and Dad were with us the whole week through a series of experiences. What a perfect way to honor the memory of a loved one through making a home possible for a family in need! The people living in and around La Florida were warm, friendly, very hard-working, clean and well-groomed despite the fact that probably about two-thirds live in the woven stick built huts with dirt floors and have to carry all water to their homes. La Florida is at the foothills of the Andes, and the landscape there is somewhat reminiscent of the moon. There is no vegetation of any sort on the hills. Only where someone plants a tree (weeping fig) or flowers and waters them is there any plant life. This was the most barren place I’ve ever seen — makes the Arizona desert seem like a tropical rain forest. Not even a stray weed grows there. Described as a high desert, this area receives less than an inch of rain per year. Nevertheless, many from the village are farmers — extremely resourceful farmers. They have cultivated fields in the valley flatlands around the town with a series of ditches and irrigation canals to channel water from a nearby river to the crops. I’ve already been told that only I could go to the desert and experience a torrential downpour. And, yes, we did have a downpour, at least by their standards — for a day and a half, what was a torrential downpour to them, was a heavy mist for me. While the top surface of ground eventually got wet and muddy, my clothes were barely damp. The camp director where we stayed told us he had lived there for 12 years and had only seen a day like that about three times. Our task for the week was to complete ten homes in five days with about 50 U.S. volunteers plus local maestros or tradesmen and the homeowner families. As with any blitz build, like this, they cheated a bit and had the foundations and exterior brick walls up when we arrived. On Sunday, before the build started, we were treated to two opening ceremonies. The first was by local government officials where we marched to spirited music in parade style through the village square carrying a large Peruvian flag, The Fuller Center banner and a small military color guard. The second was held in front of the Fuller Center office where we were introduced to the ten families that we would work with for the week. This town of about 3,500, which looks like the place that time has forgotten and forsaken, now has 38 new Fuller Center homes with hopes for many more. And, while we were there, poles were being set to extend the electric system, trees were being planted and street signs erected including a main boulevard named in honor of Millard Fuller. On Friday, another celebratory parade with small marching band to dedicate that newly named street. There was literally dancing in the dirt streets. 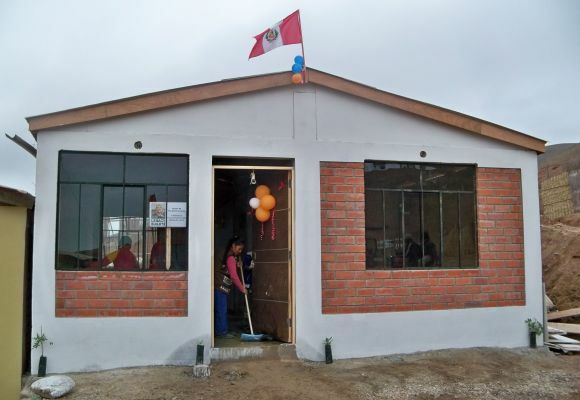 In the bleakest of surroundings, these Peruvians define how to be thankful and joyous. That parade ended up the hill in front of the home built in memory of Mom and Dad where the next home dedication took place. House leader Lorrie presented the Bible to new homeowner Domatilda. I, then spoke a few words, presented the family with the photo of Mom and Dad which had hung on the front of the house. The mayor and I jointly held a hammer and with one whack, broke the bottle (of whatever it was) that hung over the doorway as their custom of christening or blessing the home. Domatilda, in true form, as soon as photos were finished had her broom and was cleaning up. What an amazing ‘walk of faith’ this experience was. I am thankful for each of you who walked with me through your prayers, thoughts and support. 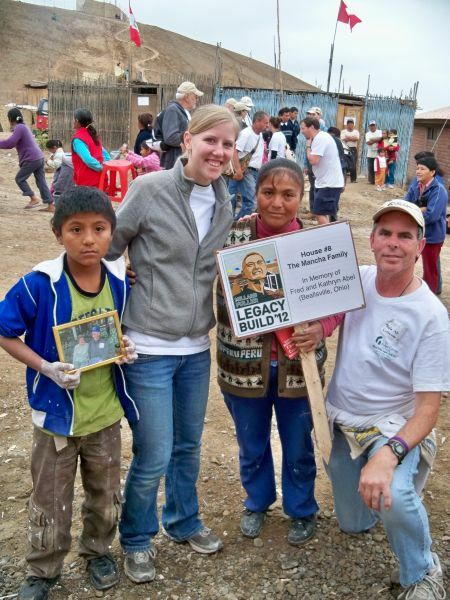 View photos from the 2012 Millard Fuller Legacy Build in Peru by clicking here. Click here to see many ways you can honor others with your service. Bob, what a wonderful week it was and what a wonderful tribute to your parents. 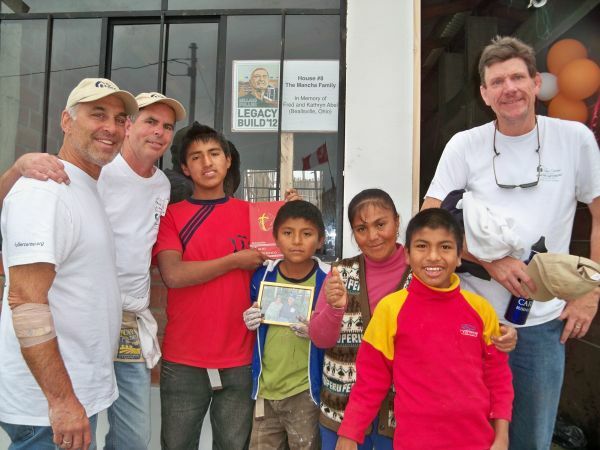 I am honored that I got to meet you and so many other wonderful volunteers and Peruvian homeowners in La Florida. The spirit is palpable and will continue to bless, strengthen, and embrace all who work. live, and travel there.